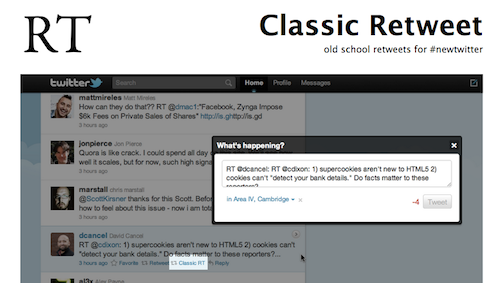 The Classic Retweet extension is available for both Chrome and Firefox, and it's easy to install. You can decide when you do a retweet using Classic Retweet whether your edits to the tweet merit changing the RT (retweet) abbreviation at the start of the tweet to MT (modified tweet). Are there any other browser extensions you use with Twitter? Share with the #UOConference hashtag!